Extra Sugarfree Gum, 35 Piece Pack (6 packs) - HOT Deal! Home Amazon Extra Sugarfree Gum, 35 Piece Pack (6 packs) HOT Deal! My kids like Extra Gum, so I bought this Amazon deal (again)! 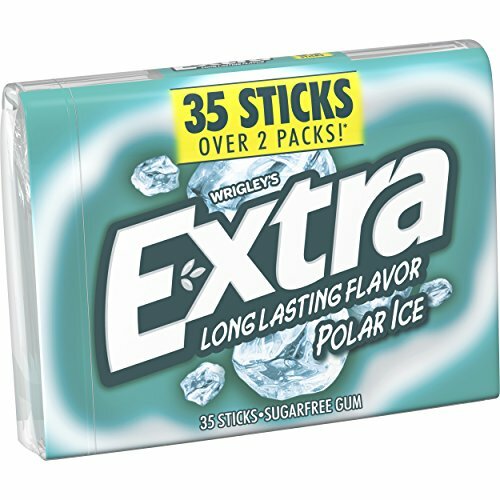 Hurry and get the Extra Polar Ice Sugarfree Gum, 35 Piece Pack (6 packs) today for only as low as $8.06 from Amazon when you choose Subscribe & Save with at least 5 subscriptions! That’s only $1.34 per giant pack! Want it sooner? Choose one-time purchase & pay $9.48. Amazon Prime members get FREE 2-day shipping!! If you are not a Prime member, get FREE shipping when you purchase $25 or more of eligible items across any product category. Check out the Extra Gum details below. Sharing a piece of Extra gum helps you live life’s little moments. Give Extra, get extra. Extra knows that when you give a little more, you get more in return. That’s why there are more ways to share a moment in every pack. So give a piece to friends, family, or someone new. It might seem like something little, but sometimes the little things last the longest. Extra sugar-free chewing gum: celebrating life’s meaningful connections, one piece at a time. Polar Ice Flavor—An avalanche of icy flavor. Give in to the sensation of mint, and introduce your mouth to the Arctic. Give Extra, get extra. Buy the Extra Polar Ice Sugarfree Gum, 35 Piece Pack (6 packs) from Amazon.As always, Amazon Prices can change quickly. If the price is up, the deal is simply over! Be sure to join our Hot Holiday Deals Facebook group and our Daily Email Newsletter so you never miss out on the best daily deals.